To take part, all Craftsman Club members have to do is bring in any competitor wrench to their local Sears store (excludes specialty stores) and they will receive a brand new Craftsman 9/16” Combination Wrench on the spot. All of the metal from the wrench trade-ins will be scrapped with the proceeds donated to Rebuilding Together. 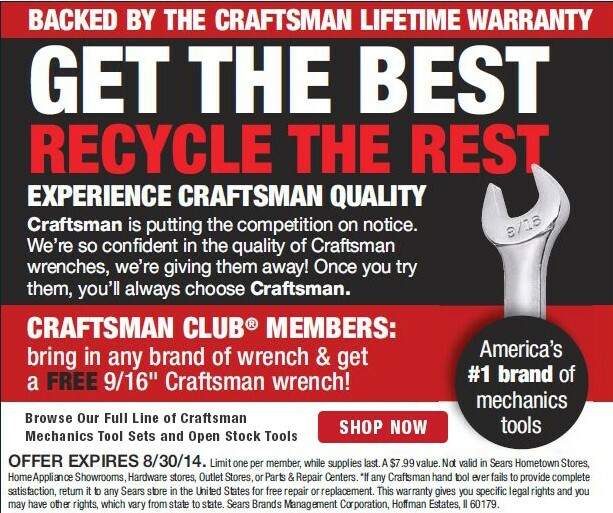 If you are not already a Craftsman Club member, it is completely free, and you will have an opportunity to sign up during checkout or by visiting http://club.craftsman.com. Once signed up you will receive additional promotional news, product information and tips. Millions of U.S. veterans are in desperate need of repairs and adaptations to their homes. Rebuilding Together’s Veterans Housing was created to meet the growing needs of veterans from past and present wars. Rebuilding Together fills the gaps in modifications and repair services that retired and active service men and women struggle to meet. In partnership with corporate sponsors like Sears, Rebuilding Together’s Veterans Housing strives to provide safe and accessible housing for all low-income veterans. The need is great. For veterans returning from service in the Global War on Terror with severe injuries such as amputation or Traumatic Brain Injury (TBI), readjustment and reintegration into their families and communities can be difficult.